What is a Magnetic Compass, its principle, types and errors? 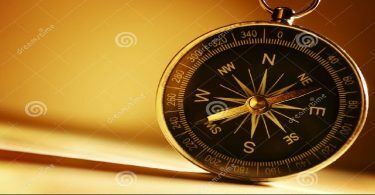 A compass is an instrument containing a freely suspended magnetic element which displays the direction of the horizontal component of the Earth’s magnetic field at the point of observation. Magnetic compass is the most important of all instruments aboard even the most modern vessel and it is probably the most reliable. It’s origins go back as long ago as 2300 BC, but the Chinese development of the compass card dates to the 14th century and the sophisticated instrument we know today became stabilized with the advent of steel ships in the 19th century. 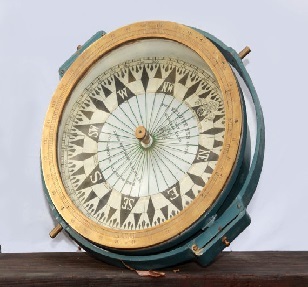 Magnetic compass is a primary means of navigation as a direction indicating device, of a ship. It is the ships standard compass. It is fitted above the bridge on the monkey Island at the centre line of the ship. When reading output is needed to other bridge equipments, then a transmitting magnetic compass is fitted. 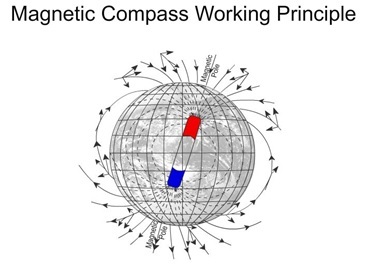 The Magnetic Compass is the most familiar compass type. It functions as a pointer to “Magnetic North”, the local magnetic meridian, because the magnetized needle at its heart aligns itself with the horizontal component of the Earth’s magnetic field. The magnetic field exerts a torque on the needle, pulling one end or pole of the needle approximately toward the Earth’s North magnetic pole, and pulling the other toward the South Magnetic pole. The needle is mounted on a low-friction pivot point, in better compasses a jewel bearing, so it can turn easily. When the compass is held level, the needle turns until, after a few seconds to allow oscillations to die out, it settles into its equilibrium orientation. A Magnetic compass is a critical piece of marine navigational equipment. Simply put, a magnetised needle, suspended freely, points North because of the forces caused by the Earth’s magnetic field. Once North is known, the other directions are easily found. A magnetic compass works because the Earth is like a giant magnet, surrounded by a huge magnetic field. The Earth has two magnetic poles which lie near the North and South poles. The magnetic field of the Earth causes a magnetized ‘needle’ of iron or steel to swing into a north-south position if it is hung from a thread, or if it is stuck through a straw or piece of wood floating in a bowl of water. A compass points north because all magnets have two poles , a north pole and a south pole, and the north pole of one magnet is attracted to the south pole of another magnet. The Earth is a magnet that can interact with other magnets in this way, so the north end of a compass magnet is drawn to align with the Earth’s magnetic field. 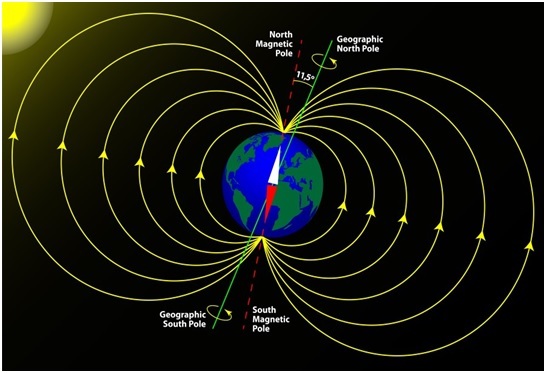 Because the Earth’s magnetic North Pole attracts the “north” ends of other magnets, it is technically the “South Pole” of our planet’s magnetic field. How accurate is the magnetic compass? As long ago as the 15th century, mariners noticed that the needle of a magnetic compass does not point accurately to Earth’s true north. Columbus, for instance was aware of this on his voyages across the Atlantic in the 1490s. Instead, the needle makes an angle with true north, and that angle varies from place to place on the Earth’s surface. This means that there is a different magnetic variation for different places on Earth. These variations were investigated on a famous 17th century voyage by the great scientist and astronomer Edmond Halley. It was thought at this time that the longitude of a ship could be found by the compass variation, but this proved to be untrue. In olden days there used to be a dry card compass on the upper bridge for use in navigation. It is now part of history. Silk thread used to be attached. The weight of the card is usually around is grams. The ring magnet wet card compass is the most efficient type of marine magnetic compass. The bowl is filled with a mixture of distilled water and pure ethyl alcohol so that the mixture has the following properties. Does not discolor the card. By immersing the card in a liquid, oscillations caused by vibration, rolling & pitching are damped, without loss of accuracy. The card therefore has a dead beat movement which is convenient. The true North Pole and the magnetic north pole are not located at the same spot. This variation causes a magnetic compass needle to point more or less away from true north. The amount the needle is offset is called variation because the amount varies at different points on Earth’s surface. Even in the same locality variation usually does not remain constant, but increases or decreases at a certain known rate annually. The variation for any given locality, together with the amount of annual increase or decrease, is shown on the compass rose of the chart for that particular locality. How to calculate variation from compass rose. Variation remains the same for any heading of the ship at a given locality. No matter which way the ship is heading, the magnetic compass, if affected only by variation, points steadily in the general direction of the magnetic north pole. 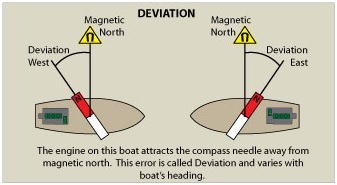 The amount a magnetic compass needle is deflected by magnetic material in the ship is called deviation.Although deviation remains a constant for any given compass heading, it is not the same on all headings. Deviation gradually increases, decreases, increases, and decreases again as the ship goes through an entire 360° of swing. The magnetic steering compass is located in the pilothouse, where it is affected considerably by deviation. Usually the standard compass is topside, where the magnetic forces producing deviation are not as strong. Courses and bearings by these compasses must be carefully differentiated by the abbreviations PSC (per standard compass), PSTGC (per steering compass), and PGC (per gyrocompass). The standard compass provides a means for checking the steering compass and the gyrocompass. A turn from the north lags or indicates a turn in the opposite direction. So to roll out on the correct heading one must roll out of the turn, past the correct heading.A turn from the south leads. So to roll out on the correct heading one must roll out of the turn, before reaching the correct heading. REMEMBER: THE SOUTH LEADS AND THE NORTH LAGS and THERE IS NO ACCELERATION / DECELERATION ERROR ON A NORTH OR SOUTH HEADING. When on an east or west heading, any increase in airspeed (Acceleration) will cause the magnetic compass to indicate a false turn toward the north, and any decrease in airspeed (deceleration) will cause the magnetic compass to indicate a false turn toward the south. REMEMBER: ACCELERATE NORTH & DECELERATE SOUTH and THERE IS NO TURNING ERROR ON A EAST OR WEST HEADING. This error is caused by turbulence or rough control movements and results in erratic movement of the compass card. Oscillation is a combination of all of the other errors, and it results in the compass card swinging back and forth around the heading being flown. When setting the gyroscopic heading indicator to agree with the magnetic compass, use the average indication between the swings. Magnetic dip is the tendency of the compass needles to point down as well as to the magnetic pole. 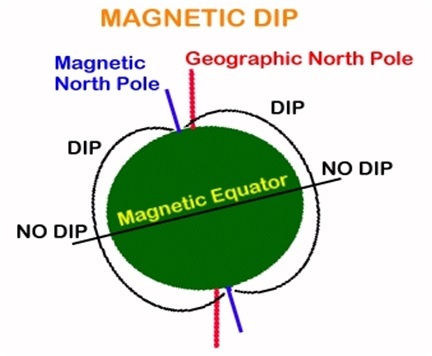 Dip is greatest near the poles and least near the Magnetic Equator. The compass card is designed to operate in the horizontal, therefore, any movement from the horizontal plane introduces dip error. The needle of your magnetic compass will be parallel with Earth’s surface at the Magnetic Equator, but will point increasing downward as it is moved closer to the Magnetic Pole. 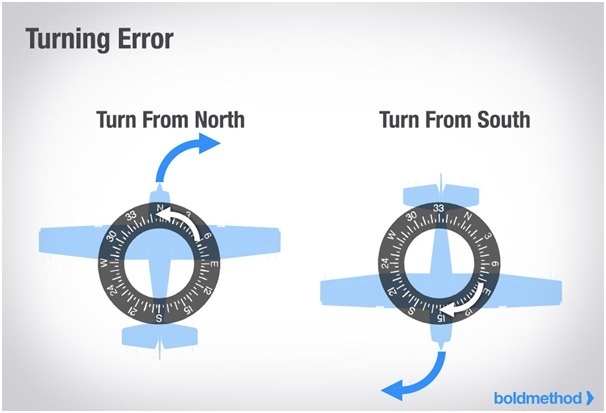 Northerly turning error is due to the mounting of the compass. Since the card is balanced in fluid, when the aircraft turns, the card is also banked as a result of centrifugal force. While the card is banked, the vertical component of the Earth’s magnetic field causes the north-seeking ends of the compass to dip to the low side of the turn. When making a turn from a northerly heading, the compass briefly gives an indication of a turn in the opposite direction. When making a turn from the south, it gives an indication of a turn in the correct direction but at a faster rate. Acceleration error is also due to the dip of the Earth’s magnetic field. Because of the way the compass card is mounted, the aft end of the compass card is tilted upward when accelerating, and downward when decelerating during airspeed changes. This error is most pronounced on an east / west heading. When accelerating on an east or west heading, the error indicates a turn to the north. When decelerating on an east or west heading the error is toward the south. To see summary of magnetic compass Error, Click here. The doors giving access to the corrector magnets should always be kept locked and the keys kept is safe custody. It the binnacle is of wood, it should be varnished not painted, as paint may cause the door to jam. The soft iron spheres (quadrant correctors) and their brackets should be painted. This prevents rust. The brass parts of the binnacle should be polished regularly. All magnetic materials such as aerials stays, electrical machinery, electrical wires etc should be kept well away from the compass. The helmet of the binnacle should be in position always except during the short periods when bearing are actually being taken. The binnacle light should be switched off at daytime. The wet compass card, if found defective owing to stickiness of movement has to be renewed by the manufacturer or his authorized agent. Here no spare wet card is carried. Instead an entire bowl is carried as a spare. In pare cases a bubble may develop in the wet compass bowl. This has to be removed at the earliest opportunity. Tilt the bowl until the “filter hole” comes upper most. This hole is provided on the side of the bowl. Top up with ethyl alcohol. If this is not available distilled water would be added. Screw the stud/screw back into place. Gently let the bowl return to upright. Invert the bowl gently. This would cause the bubble to enter a bubble trap provided for this purposes. Gently return the bowl to upright. The bubble should have disappeared. If the bubble is large. It would have to be removed as described in (1) to (5) above. At least 1 magnetic compass vessel GRT 150 or more must have 1 spare magnetic compass. If Satellite compass onboard require 1 magnetic compass. If both magnetic compass burnt L/B compass may use. 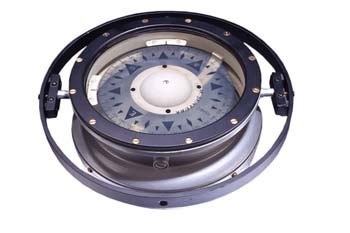 Vessel 500 GRT or over must have gyro compass. To use magnetic compass deviation card is required. Magnetic compass will not show true north. It will deflected by electric flow. It will deflected by magnetic field. Fill up with distilled water and ethyl alcohol mixture. Keep it vibration less dry place. Safe distance from electronic equipment. Dimmer light to be checked. The standard magnetic compass should, where practicable, be so positioned to maximise its distance from the ship’s magnetic material. While this might be difficult to achieve in respect of the fore end of the bridge or compass deck, the maximum, reasonable, distance should have been achieved e.g. by raising the binnacle on a platform. Any magnetic material which is in the vicinity of the compass should preferably be positioned symmetrically, relative to the compass. In ships of unusual design or special purpose, and some small ships, adequate separation of the magnetic compass from magnetic material may not be practicable. The plans submitted at the design stage should include any proposed arrangements, for example, the use of under deck binnacles, and/or the use of non-magnetic materials, intended to minimise the effect of the ship’s structure on magnetic compasses. A copy of the deviation card after each adjustment of the compass. Sample deviations over a range of latitudes, courses and dates, extending over a period of six months from the date of the first compass adjustment, sufficient to make an overall assessment of the general performance of the compass. A statement by the Master as to his opinion of the standard compass performance over the six month period described in (b), with comments e.g. whether relevant correctors were adjusted for latitude, etc. Freedom of movement of the gimbal. Card floating freely and level, and rotating without any friction. Liquid free of bubbles and clear. Compass card clear and sharp (able to be read) with no distortion or discoloration. Optical system (if any) correctly adjusted and clean. Azimuth reading devices and means of illumination in working order. No liquid leaks around seals or filler plugs. The compass deviation records and the deviation card for each magnetic compass installed on the ship should be checked. What are Effects of Changes in Magnetism During the Life of a Ship? The ship has been laid up or has been lying idle – even a short period of idleness can lead to serious deviations, especially for small vessels. Further to (b), the retentive magnetism can alter a ship’s magnetism, making compasses unreliable. However, a large amount of the magnetism induced by an electromagnet may subsequently decay so immediate readjustment is not advised. Every effort should be made to determine the compass deviation. What are Adjustments and Repairs of Magnetic Compass/Who can make adjustments in magnetic compass? In the UK, all adjustments should be made by a compass adjuster who holds a Certificate of Competency as Compass Adjuster issued by the UK Government. 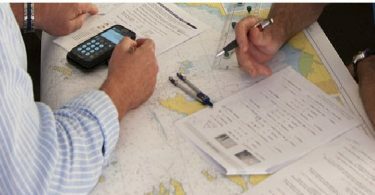 If a qualified compass adjuster is unavailable and the Master considers it necessary then adjustments may be made by a person holding a Certificate of Competency (Deck Officer), Class 1 (Master Mariner). 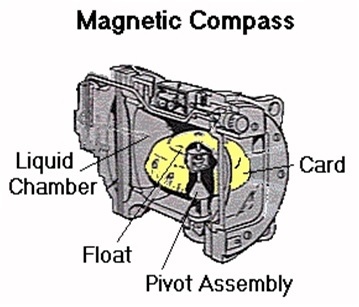 The compass must be re-adjusted by a qualified compass adjuster at the next available opportunity. The date of any adjustment and other details should be noted in the compass deviation book. The position of correctors should be recorded in the compass book and on deviation cards. Because the distances from the coefficients B and C correctors to the standard compass card and to the transmitting element are different, a transmitting magnetic compass will be overcompensated resulting in an error, which can be as much as 2½° and cannot be corrected. Separate deviation cards should be prepared for the standard compass and the transmitting magnetic compass repeater by comparing headings. Repairs should only be made by a compass manufacturer or other competent person using the proper test facilities. When the work is finished the repairer should supply the owner or Master with a certificate, specifying that the work has been carried out in accordance with the necessary requirements ISO for Class A Compass and ISO 10316 for Class B Compass which are the International Standards for the Magnetic Compass. Compass performance should be monitored by frequently recording deviations in the compass deviation book. Compass errors should be determined after every large alteration of course, and at least once every watch when there have been no major course alterations. Checking the compass deviation regularly may show the need for repair, testing or adjustment. In addition, compasses should be inspected occasionally by a competent officer or compass adjuster. Can we use magnetic compass at the pole? No, we cannot use magnetic compass at pole because at the pole the directive force is Zero. At the equator the magnetic compass is more accurate. How many type of liquid used/ added in magnetic compass? Mixture of distilled water and ethyl alcohol , Two part of distilled water and one parts of ethyl alcohol providing a fluid with low viscosity and small coefficient of expansion. Distilled water will reduce evaporation in worm tropical climate. Alcohol will reduce frizzing point of mixture in cold weather. Provided additional flotation for card. Reduce motion on the card. What are the types of Magnetic compass ? What are errors of magnetic compass? Where magnetic compass is placed/kept onboard? What are operational checks carried out in magnetic compass? What are Adjustments and Repairs of Magnetic Compass? What are Passage Plan Final Check Points?